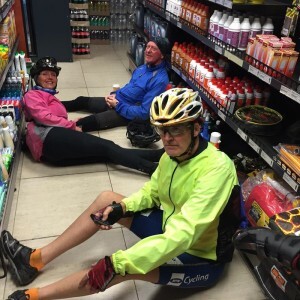 The first unexpected aspect of the final Cape 300 qualifier was that 14 brave souls pitched up to ride at midnight with a distinctly unpromising weather forecast. I must confess, half of me had been hoping that no one showed up so I could go back to the warmth of my bed – some chance! It was cold but at least dry when we set out – sadly that did not last long. A light drizzle started within the first few kilometres, soon becoming a steady downpour that looked set to be far more persistent than the occasional showers predicted. I suppose in Audax terms, shredded tyres are not totally unexpected, but rare all the same. Oddly this was the second occurrence on our Cape Audax series, both of them happening on the 300. Sadly on this occasion, the other unexpected element of this scene did not help. Although I do carry a spare, it was of no help this time around – at 28mm wide it was too large for the afflicted rider’s frame. We did at least manage to share a spare tyre boot to get the guys underway. The railway crossings on the approach to Franschhoek contributed the next unexpected, and thoroughly undesirable element. It was even harder than usual to gauge a safe trajectory in the dark, and the rails were extra slippery in the rain. A number of us skidded and slid scarily across these, and two of our riders fell. Derek was badly scraped and bleeding by the time he reached us on Franschhoek Pass, but fortunately still able to continue. Sadly the other fallen rider (Walter) had broken his rear derailleur and was forced to withdraw. 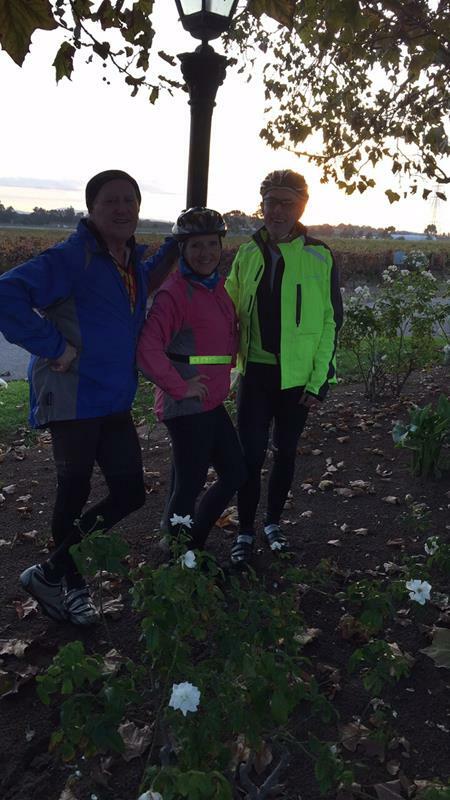 Barely a couple of hours into the ride, and we were down to 10 riders – three of Walter’s friends deciding to retire with him. The rest of us battled on up the pass – the rain was pelting down and it became icy cold on the descent. Rounding a bend somewhere part way down the pass I came across a worrying scene. Just in front were the headlights of a stationary car, bikes gathered all around. My heart skipped several beats as memories of the recent tragic accident on this stretch of road flashed into mind. Fortunately the truth was far more bizarre – the guys had stopped to try and help the motorist, who had somehow got his car stuck on top of a giant rock. Unexpected doesn’t really come close to summing this one up – all that could be seen of one of the guys from the car were a pair of legs sticking out. There was no sign of him being able to shift the rock, and he was in serious peril of being crushed by his own car. At one stage he screamed that the wheel was stuck on his foot. Eventually sense prevailed, and with six or seven riders plus the blokes from the car, we managed to bounce it off the rock. Once moved, it was clear how futile any attempt to roll the rock out from underneath had been – it took at least two of us to lift it to the side of the road. It’s hard to decide which of the two events are more unlikely here: that someone could manage to drive onto a rock so big that the car became completely stuck; or that a bunch of cyclists would be seen coming down the pass at 2am on a miserably cold and wet morning to help them off it. You had to be there. Everyone was drenched and shivering as we rolled into the first control in Villiersdorp. It had been raining hard on us for all but around half an hour of the ride to this point. The laughing and joking as we tried to warm up with coffee and hot chocolate probably came from a place closer to desperation or hysteria than actual good spirits. 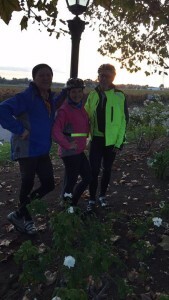 I was rather amazed that our rookie Randonneurs, Desiree and Louna, were still with us. Lesser riders would have been looking for an early exit rather than heading back out again in the cold, the wet, and the dark. The rain was easing off as we headed out of town began the climb over Rooihoogte and had stopped completely soon after we’d dropped down the descent into the lush farmlands beyond. Not that we got to enjoy it. Normally we’d have been bathed in early dawn light and enjoying the wonderful views of the narrow lush valley flanked both sides by steep mountains. By some madness, I’d listened to the guys calling for a midnight start. Not only had this consigned us to the previous few hours of miserable weather, but it meant the sunrise would only greet us somewhere around the start of Slanghoek valley. 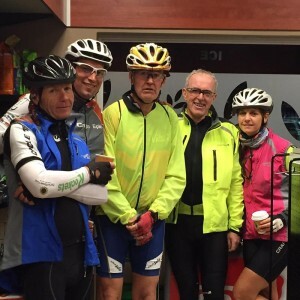 I vaguely recall muttering something to the riders around me about how democracy had no part on an Audax ride, and wishing I’d put my foot down and stuck to our usual 3am start. There really wasn’t much point dwelling on that now, so I focused my energy on pulling hard to see if I could haul back a group of three riders who were a few hundred meters ahead. Our pace remained high through the outskirts of Wellington, but we made no real progress at chasing them down. I was beginning to fade as we reached the T-junction by Nekkies, and it was a relief to see that Nico and the guys had pulled over to wait for us. Even with them stopping I struggled to keep up over 15km to the next control in Rawsonville. Theunis dropped back a couple of times to help pull me back into the group. I’d pushed too hard and was now short on fuel – I need a decent stop to fill up with coffee and food. The 24hr Total garage in Rawsonville could not have been a more welcome sight. I grabbed coffee, chocolate milk, and a bacon sandwich. At some point in the past it had been toasted, but was now flabby and cold. It didn’t matter, I was starving and wolfed it down anyway. Our group of riders littered the floor of the garage as we stoked up our reserves. Slanghoek valley and Bainskloof pass were wonderfully scenic as ever, although this time the surrounding view was brooding mountains draped in mist and clouds rather than the blue skies of the last couple of editions of this ride. My fatigue had passed and with the rain now holding back, I was riding strongly and beginning to enjoy the day. I was still cold, especially my feet, but in every other respect it was a lovely day to be out on the bike. After observing the traditional Steers stop in Wellington, we even get some sunny riding through to the other traditional stops for beers in Riebeeck West, and chips and toasties at the Wimpy in Malmesbury. The final leg home brought up our last two unexpected events. The first of these was NO WIND. It was a wonderful relief after the dreadful weather at the start of the ride to be seeing the leg home in daylight, with easy headwind-free riding. It was also very pleasant to be seeing this section of road in daylight for a change – at least one positive from our earlier than usual start. The second event comes with a very definite “do not try this at home” warning. Ever wondered what happens if you use a 16g bomb on a road tyre and then unscrew it from the adapter without venting the remaining CO2? In this case, the adapter had become jammed to the tyre valve, so it was an attempt to free things up. The attempt did not go well and what transpired happened so fast, that we stood there in shock, followed by fits of laughter. There was a loud crack, the bomb shot within millimetres of Theunis’ leg, flew across the road, and disappeared somewhere hundreds of meters away in the field opposite. By a miracle no cars were passing – the deadly missile would have probably cut right through. An unlucky cow or sheep close to the fence the other side of the road would also in all probability have come off rather badly. 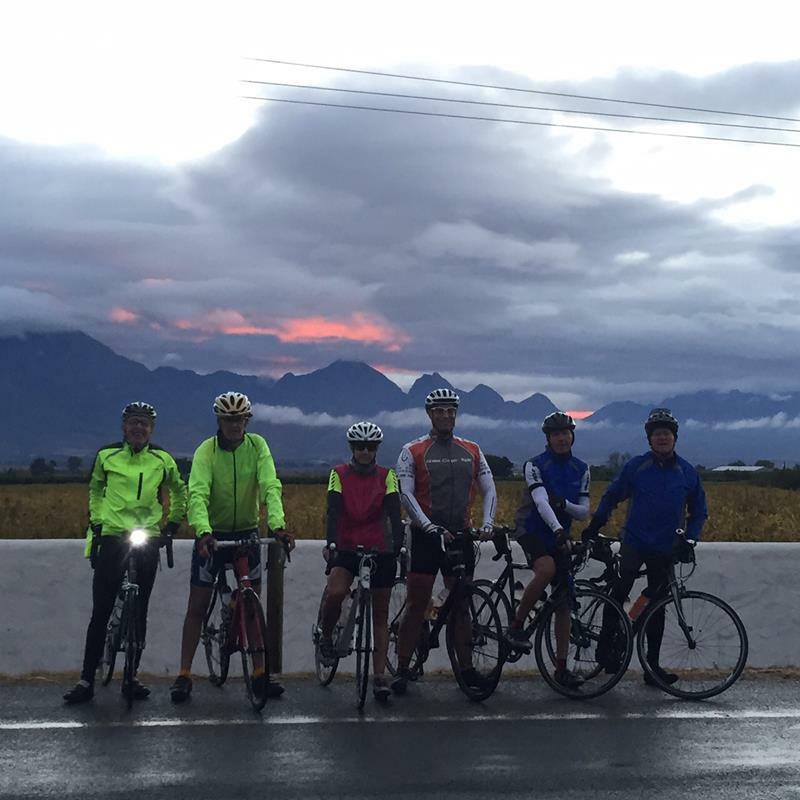 The few remaining kilometres of the ride were peaceful and serene by comparison, arriving back at Vrede just in time to watch the sunset. Oh, apart from Theunis’ second mishap – discovering that electronic keys do not like sitting in soggy cycling jersey pockets for hours on end. At first the key was unable to unlock his steering, and then refused to work any of the electronic systems in his car. It required a hasty lift back to Somerset West to collect a spare key. I must confess, my car key is also electronic and it’s never occurred to me that riding in the wet could kill it off. Definitely going in a plastic bag next time!